The Nexus 4 is finally here and is priced at Rs. 25,990. If you have been waiting for this device, just go and pick it up. It’s awesome. The display is good, performance is excellent, you will be the first to receive all the Android updates and the phone simply looks gorgeous. On the downside, there is no expandable storage, the camera is lacklustre in low lighting and the earpiece has audio leaking. If you are searching for a smartphone between Rs. 25,000 and Rs. 30,000, the Nexus 4 can be at the top of your list along with the LG Optimus G, Samsung Galaxy S III, Samsung Galaxy Note N7000 and the HTC One X+. If you are thinkin' about my baby, it don't matter if you're black or white," as Michael Jackson sang, and that would be a good job too because as we found out with the white Nexus 4 just announced by LG and Google, it's white, but also black too. We were treated to a hands-on at the company's headquarters in the UK, and though the new Nexus 4 still doesn't have a UK release date, a spokesperson for the company told Pocket-lint that it isn't ruling anything out yet. 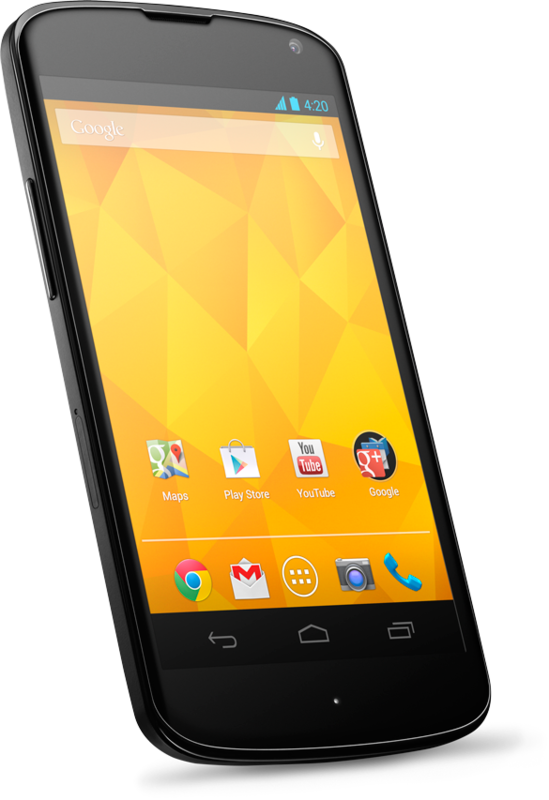 Like the Nexus 10, the Nexus 4 is another class leader. Google have combined a refreshed version of their operating system with a well designed, powerful phone that’s more cost-effective than anything else on the market. The Nexus 4 goes head-to-head with the likes of the Samsung Galaxy S3 and iPhone 5, and while it might lose out in some areas such as slimness and storage options, its £239 price more than makes up for its few shortcomings. 0.139 kg: Solo algunos smartphones son más livianos que eso. 85.17%: Esta es una buena evaluación arriba del promedio. Sin embrago, no se olvide que 10-15% de todos los modelos de portátiles obtienen una mejor evaluación.